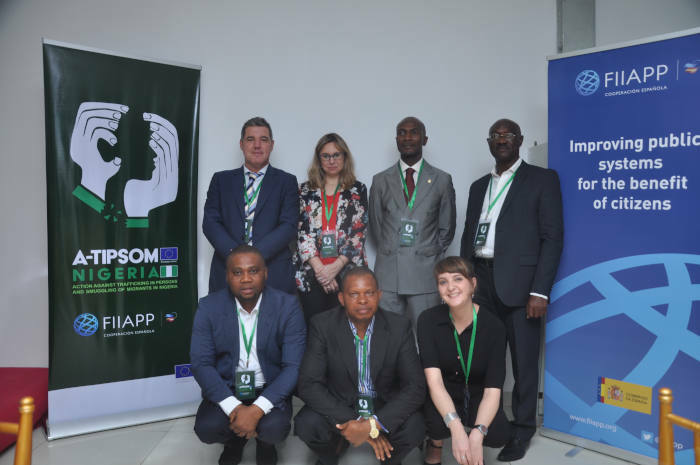 This project, financed by the European Union and managed by FIIAPP, was presented at a conference in the capital of Nigeria, Abuja, where the objectives of A-TIPSOM were presented: to fight against human trafficking and illegal immigration. Likewise, A-TIPSOM seeks to strengthen the institutions and the legal framework, protect the victims, prosecute the dealers and traffickers, coordinate the players involved and prevent such activity with awareness and training activities. According to Rafael Ríos, coordinator of this project, the situation in Nigeria right now is complex, since “the country is a strong point of migration and transit” due to the fact that it is in the centre of the African continent. In addition, “the number of women and children who are victims and who fall into the network of prostitution and labour exploitation, according to statistics, is higher than that of men”, which is why they focus more on these groups. The National Police were also present at the event and will provide this project with specialists in the fight against human trafficking and illegal immigration in the African continent, leading the battle against this new form of slavery. The opening of the event was also attended by the Spanish Ambassador to Nigeria, Marcelino Cabanas, the head of the European Union Delegation in Nigeria and ECOWAS, Ketil Karlsen, representatives of the National Agency for the Prohibition of Trafficking in Persons in Nigeria (NAPTIP) and the civil area.